3.5 out of 5 for the weekend angler. 1.5 out of 5 for the tournament angler. Some ponds are too small for bass boats with all the latest gadgets, but some are just big enough that it would be really handy if you had them. We'll the Humminbird RF35 takes some of the guess work out, and really comes in handy for new ponds or places bass boats can't get to. HTB and other anglers like yourself tested this product for over a week and it had mixed reviews. That's why we ended up giving this product two different scores. Keep reading for all the "reel" information about this product. Starting off with a brief introduction of the product, the RF35 is a wireless fish finder with two units. 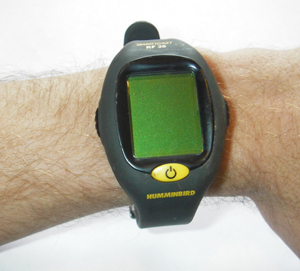 A watch, that is attached to your wrist acts as the display. Then a sonar unit that attaches to the end of your fishing line which is then thrown out into the water. Within a second your display will show what's beneath. More in depth features include fish pick-up sensitivity, (In case your going for the big ones and not the little ones.) an indaglo light for night fishing, water temperature display, a "beep" fish alert so you don't have to look at the display constantly and more. So you're probably wondering why this product received two different scores. Well we split it into two categories because it depends what kind of angler you are. The two categories are tournament angler and weekend angler. The tournament angler gave the product a score of 1.5, and the weekend angler gave it a score of 3.5. Bottom line, as a tournament angler you just don't have time to cast anything other than a lure. Even if it would let the angler know where the bass are in a spot that can't be reached by the boat, the angler would still have better chances just blind casting vs. time available. The information that we got back from one of our weekend anglers headed to a local pond. Here's some of what he had to say about the product. "I've been fishing this 2 acre pond for years and had no idea what was in it..... I have a new sweet spot, and I know exactly where they like to hang out." "In my view it's pointless to use in 2 feet of water or less." "Watch battery only lasted a week, givin I was using it non-stop for that period." "The best thing for ponds..... I now have a full detailed map of this pond." The other weekend angler we had test out on our local lake with no boat. Here are some of the things he had to say. "My wife and I extremely enjoyed it." "We usually fish from dock to dock and never realized until now we made a mistake..... really we just had to figure out what they wanted to bite on....." "downside is if it got to wavy the sonar would skip a beat on the display..... it got a little annoying when boats drove by even in a no wake zone." After seeing some of these comments we were able to match up on what they had to say. Another plus we wanted to add was how accurate the sonar device actually is. It is accurate up to 120' in depth and up to 75' away. We found out though if it was wavy as the couple said, it even cut out all together at its 75' range. Expect the fish to be right under the unit once they pop-up on the screen. Finally the price. 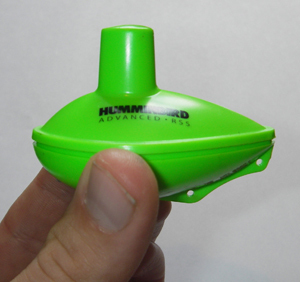 You can find the Humminbird RF35 anywhere from $70 - $95. We suggest buying it online. Overall, it's a great product for the weekend angler who ideally would use it in ponds rather than lakes. Positive notes: accurate, easy to use. Negative notes: takes another fishing pole to use if you plan to fish at the same time. Signal breaks up if it's too wavy. Watch battery died quickly. Our thought's left us kind of in the middle. It could be a great thing for you, and it might not. That is left up to you for your specific situation. We just wanted to give you the facts of what we found out about it as usual. Enjoy. If you have a lure or product you would like HTB to test out, send an e-mail to products@howtobass.com and title it Product Testing.